Rachel Freyda Kudlowicz, born in 1910, married Yeshayahu Brandmesser approximately two years before the outbreak of World War II. The couple lived in Ostrowiec, Poland. After losing their firstborn son to illness, Rachel once again became pregnant, and their daughter Gitele was born only four months before the outbreak of World War II. The manager of the family flour mill, Henryk Malkiewicz, proposed that the family hide in his home in the nearby village STOKI MALE but only after the great Aktion in Ostrowiec in October 1942 did the family accept his offer. The Brandmessers with their baby, Rachel’s sister Henya, her brother Shamai and two other relatives all found refuge in Malkiewicz’s home. Henryk’s mother objected to the presence of the baby for fear that it would endanger them all and asked the parents to give her up. Rachel and Yeshayahu refused to be separated from their daughter and the three abandoned their hiding place. Due to confrontations with hostile neighbors, the others were also forced to leave the Malkiewicz home, but not before Henryk managed to find a different hiding place for them, all the while continuing to look after all of their needs. After the war, Henryk Malkiewicz was awarded the title of Righteous Among the Nations for his valiant actions. With their liberation in January 1945, Rachel’s siblings Henya and Shamai emerged from hiding and returned home. A Polish neighbor returned to them some of their possessions that he had preserved in his home, including Rachel’s engagement dress. 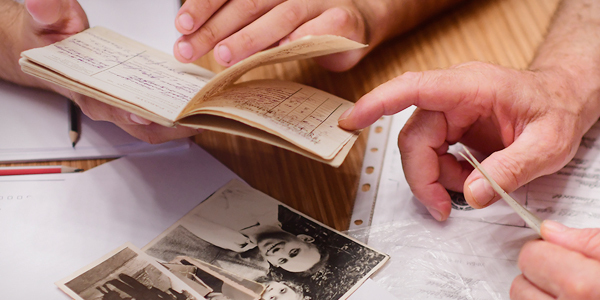 Only with time did Henya and Shamai learn that their sister Rachel, her husband Yeshayahu and their baby daughter Gitele had been caught and deported to Treblinka in November 1942, where they were murdered.